Treating acne is both an internal and external endeavor. Acne symptoms known as pimples begin forming from within weeks before symptoms appear on the skin, and are believed to be caused by an excessive amount of sebum, or oil, produced by the sebaceous glands. This sticky substance travels along the hair follicles, or pores, to reach the surface, and when too much is produced, it can become clogged within the pore. When combined with dead skin cells and debris collected on the surface of the skin, this pairing can lead to the growth of bacteria, which then appears as acne once the body’s inflammatory response kicks in. Because acne can hold both internal and external forces to blame, the best way to go about treating it is to keep both aspects of skin and body care in mind. Luckily for anyone with acne, the best way to treat symptoms is to get a head start, and with a few weeks of summer left, there’s no time like the present to begin preparing for a healthy and clear complexion! Just follow any (or all) of these simple tips to find yourself bringing your best face forward on those first days of classes, and beyond. Keep your skin clean, day and night. Most people wash their face upon waking, but if you’re the type to fall asleep in a face full of makeup, you could be making your acne worse! Keeping a clean surface is half the battle when it comes to acne, and washing with a gentle cleanser followed by a moisturizer suited to your skin type before bed can go a long way in keeping those pores clean and unclogged, which can result in fewer breakouts. Exfoliate.Exfoliating is an important step, and should be approached differently depending on the season, and sensitivity of your own skin. While fall usually calls for a grittier exfoliant to help wash away the dead skin cells that contribute to acne, summer usually requires a lighter hand, so a gentle chemical exfoliant once or twice a week should do the trick. For anyone looking to exfoliate naturally, just create this simple yogurt and honey mask to gently scrub away any dead, flaky skin with no risk of side effects. Keep stress levels low with a good night’s sleep.Summer vacation usually allows for at least a bit of a later wake up time for some, and that’s a good thing, as a good night’s sleep is an important part of maintaining healthy skin. Increased sebum production is linked to hormonal imbalances, and by simply snoozing around 8 hours a night, your body will better be able to balance certain hormone levels which may trigger sebaceous glands. Eat your way to a clear complexion.What you put into your body is going to affect what you see on the outside, and the right diet is essential in managing acne-prone skin. If you think this requires a huge dietary overhaul, don’t worry - just a few simple tweaks can go a long way! By doing your best to avoid processed foods, baked snacks, refined grains, and anything high in sugar, and replacing them with naturally effective options, you’ll give your skin a good shot at remaining acne-free in time for school. The easiest foods to add to any diet include antioxidant-rich strawberries and blueberries, or protein-rich nuts such as almonds or walnuts. Basically it’s important to stick to an anti-inflammatory diet for acne. So if you like getting your hands dirty in the kitchen, adding anti-inflammatory garlic to as many recipes as possible can work wonders on problem skin. Shop smart when it comes to makeup. When covering up with makeup, be especially sure to keep your brushes, sponges, and pads clean, as dead skin and old oils can easily build up on these surfaces, leading to breakouts. When shopping for skin makeup such as foundation or BB cream, look for fragrance-free, paraben-free, non-comedogenic formulas, which won’t irritate skin. Attack acne from within.Keeping the surface of your skin clean will go a long way in remaining blemish-free, but washing your face is only part of the solution. The real way to fight acne is to target the problem at its source - the sebaceous glands, to ensure that only the necessary amount of oil is being produced, no more, no less. 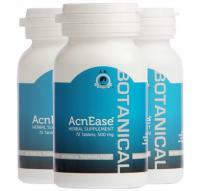 AcnEase is an all-natural solution that does just that, and because it works to create a buffer between the hormones and sebaceous glands, it will not affect hormone levels at all, making it safe for anyone to use. When it comes to bringing your best face forward, prevention is always the best measure to take, and with a few weeks of summer remaining before it’s time to head back to school, the choices you make now can go a long way in achieving clear skin when it counts! Implementing a systemic solution such as AcnEase can help take any of the above-mentioned tips for clear skin over the top, and since it works to prevent acne before it starts, can actually help reduce the amount of time you may spend scrambling to get flawless skin before that first day back. There’s still plenty of summer left, so free up your time with a solution that does the work for you! What do you do to ensure a clean and clear complexion for that first day of school? Have any tips you get started on early? Tell us in the comments!